Ever wonder how recruiters read a resume? 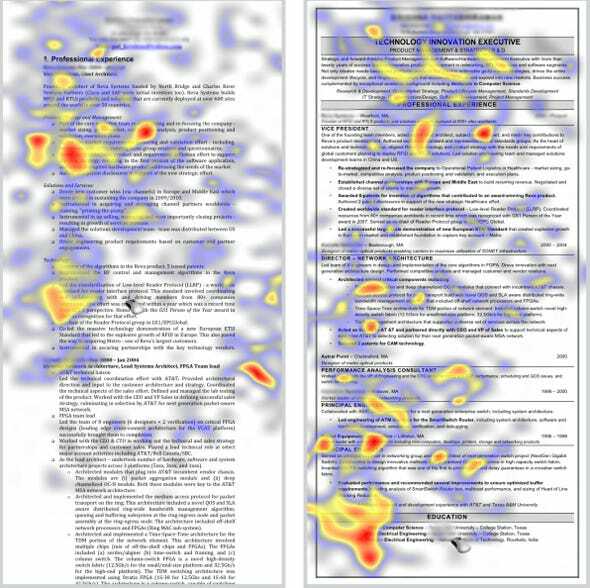 In a study published by TheLadders, researchers used an "eye-tracking" technique to identify how recruiters scan a resume. In the average of six seconds spent on each resume, recruiters look for "name, current title and company, current position start and end dates, previous title and company, previous position start and end dates, and education." Of particular interest are the heat maps tracing the "eye-tracking" movement - this is an excellent use of visualization. cool custom essay writing advice for modern student, apply for help online and you will receive it shortly afterwards. This service provides with a star quality papers. Hi to all! It's very useful article. Because, when you are looking for a job yours resume is the first thing an employer will see. I sure, that a quality resume is a 60% success. If you have some problems with this issue, so this team of professional writers http://www.essay-mania.com will help to create the perfect summary. Interesting post, I think it's true that employer notice the main thing the moments at once.If you can't writing perfect resume, don't worry.www.advanced-writer.com this writing service can help you without any problems, cheap and quickly. Hello! Great idea is to buy essay at custom term papers writing this have good prices! I am sure that resume is like a face of the employee. So this must be high-quality, interesting and show all your good sides and skills. IF you feel troubled with writing a resume - professionals at www.custom-paper-writing.org will be happy to help you write brilliant essay in a shortest time! Making a good resume is always important when you want to get a certain position. Moreover, it's necessary to know answers to those questions asked at the interview. Thank you for the nice tips, this is very useful article. This is http://www.grand-essays.com/ high-quality source if someone wants to get more. I want to have the best resume and get the best job.